Join four YT clips together and what do you get? 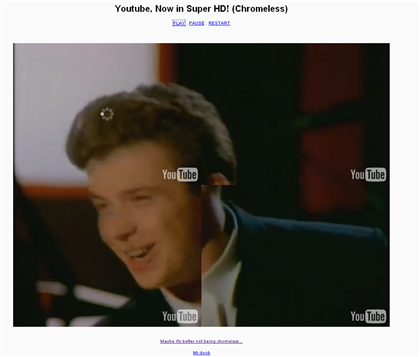 A YouTube hack that admittedly takes ages to load …but is still worth watching just for the novelty. Enjoy. (Especially the Rick Rolling bit). Wigglegrams. DIY 3D without the 3D Glasses. I like universe. I I enjoy my religion also. Should I believe in evolution or should I believe in Adam and Eve. As an educated biologists and a religious man, I just don’t know what to do . put together post. find advice noticed working on some research, and this sort of. Next story The invisible car… and it’s a Skoda! Previous story How to spot a Twitter user with a ‘Fake’ Follower Count.